Guarana is an evergreen vine native to the Amazon region, and is a natural source of caffeine. Green tea is taken from the Camellia Sinensis plant. The leaves contain potent levels of several types of polyphenols, in particular flavonoids. Satiereal® is a patented saffron extract (Crocus Sativus) from Inoreal manufactured to a particular ratio of active principles (Crocin, Picrocrocin, and Safranal), making it different from other generic saffron extracts standardized only to the safranal content. Also know as 'Bitter Orange'. Originated in tropical areas of South America and is often used to flavour food. The pepper is rich in vitamins and minerals, and is believed to hold stimulatory properties that support the way the body breaks down food and absorbs nutrients. Niacin is a water soluble B vitamin naturally found in lean meats, fish, peanuts, mushrooms, brown rice and brewer's yeast. Niacin contributes to normal energy yielding metabolism and also to the reduction of tiredness and fatigue. Used to enhance the benefits of the entire supplement by promoting nutrient absorption. Recent studies have also shown that black pepper can help to block the creation of fat cells. As a food supplement adults to take orally 2 capsules daily; one at 9am and one at 1pm. Do not exceed 2 capsules in any one day or take capsules after 3pm. It is recommended that this product is taken in cycles of 3 months on and 1 month off until your target weight has been achieved. Maximum results are achieved when taking Actislim Satiereal® along with Actislim Night. Food supplements must not be used as a substitute for a varied and balanced diet and a healthy lifestyle. This product should not be taken during pregnancy or breastfeeding. If you are taking any medication please consult your doctor or healthcare professional before use. Discontinue use and consult a doctor if adverse reactions occur. Keep out of reach of children. Store in a cool, dry place. Do not use if seal under cap is broken or missing. Do not exceed recommended doseRemember: Always read the label. 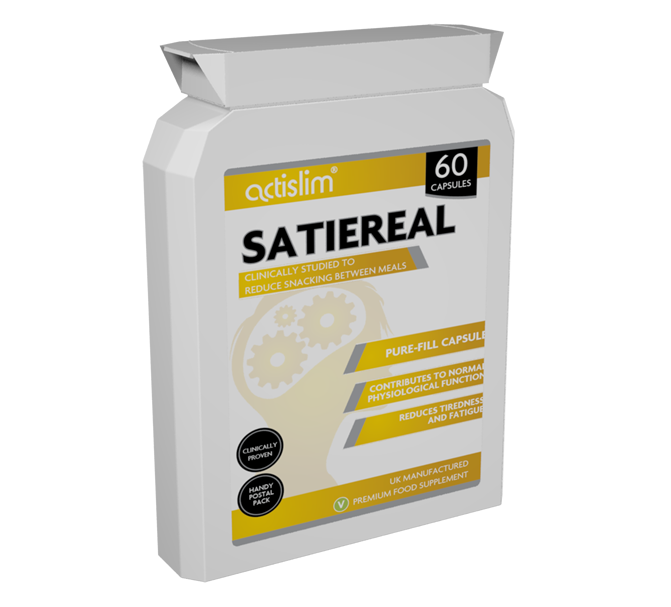 Actislim with Satiereal capsules are produced without binders, flow agents or excipients and are presented in the most natural Pullulan capsule shell available. Manufactured in the UK to the highest standards cGMP for.